A small group of water curious people listened hard through the sounds of water breaking over rocks in La Vega’s water channels to hear Cortez tell the story of the common grazing area, which is the last traditional commons left in America, and the power of The San Luis People’s Ditch, one of San Luis’ most precious veins. Running through La Vega is water from Rito Seco Creek and Río Culebra. It meanders through the meadow’s high grass and eventually finds it way to The San Luis People’s Ditch, an original acequia. 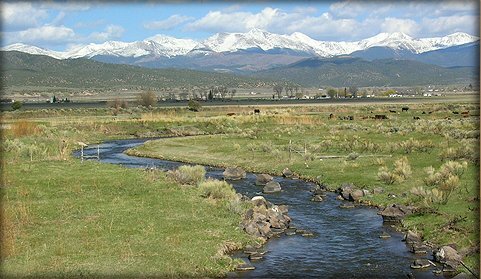 The gravity-fed irrigation system was built in 1852 and it was eventually awarded the first adjudicated water rights in Colorado nearly a quarter of a century before Colorado became a state. Within the next decade, 14 other acequias were developed in the Culebra Watershed. Today, over 240 families in the Culebra watershed use acequias to irrigate over 24,000 acres of privately owned pastures and croplands. More Colorado Water 2012 coverage here.